Hanoi (VNS/VNA) - As the demand for imported beef soars, Australian exporters are strengthening their market share in Vietnam, but the situation is fraught with risk, experts say. A Dau tu (Investment Review) newspaper report says Vietnam has become one of the largest importers of Australian cattle. In 2016, it ranked fourth among 32 countries importing Australian cattle. The report quoted Tong Xuan Chinh, deputy head of the Ministry of Agriculture and Rural Development’s Animal Husbandry Department, as saying Vietnam began importing Australian cattle in 2010. In 2012, the country had just four enterprises importing Australian cows but by 2015, the number had risen to several dozen with a total of 360,000 heads of cattle imported. Vietnamese businesses are now rushing to import Australian cows and fattening them for sale to slaughterhouses. As a result, inventories of live cattle have swelled significantly. The inventory of Australian live cattle in 2015 was estimated at 100,000 heads due to oversupply, Chinh told Dau tu, adding that in 2016, imports of cattle from Australia to Vietnam slowed dramatically as feedlot operators moved to lower their inventories. Before 2010, Australian cattle exporters were not aware of the attractive Vietnamese market. Their main partner at the time was Indonesia, importing nearly 1 million cows from Australia per year, said Luong Minh Tung, Chairman of Yen Phu Beef and Dairy Cattle Breeding JSC in Ninh Binh province. In 2011, the Australian government issued a ban on cow exports to Indonesia after reports surfaced about inhumane slaughter in some of its abattoirs, Tung said, adding that Australia also lost their strategic partner after the decision. This was the context that Australian businesses, urgently looking for new partners, found Vietnamese ones, Tung said. The import of Australian cattle for fattening had been expected to open up a new direction for the fed-cattle industry. However, Tung said, there were always latent risks in imports. He said there were too many businesses involved in importing Australian cattle, which could lead to supply exceeding demand. Instead of importing culled beef of large weights, Vietnamese firms preferred to import calves in order to fatten and sell to slaughterhouses, which offers greater profits, Tung said. However, as Vietnam didn’t have favorable conditions like Australia to breed cows, local importers have to invest a lot in infrastructure to support the influx of Australian cattle, meeting strict importing-related requirements. 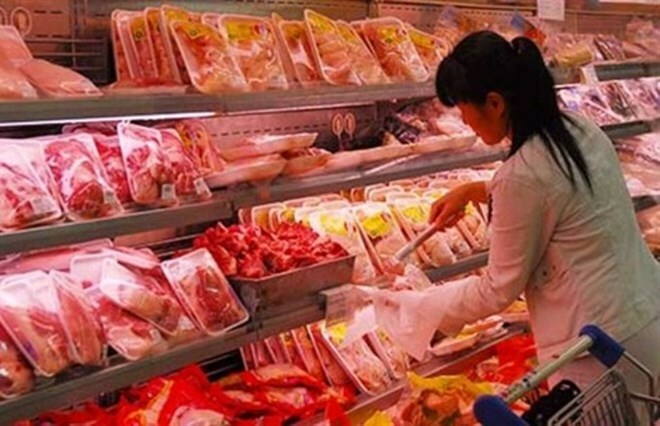 According to Hoang Dung, Director of the Hai Phong Investment and Animal Poultry Products Import Export JSC., or Animex Haiphong, Australia requires all slaughterhouses in importing countries to have modern equipment and comply with ECAS (exporter supply chain assurance system) needs. Businesses whose abattoirs are not in line with ECAS will be banned from purchasing Australian cows. Such bans could cause huge losses to many Vietnamese slaughterhouses, Dung said, adding that although there were thousands of standard slaughterhouses, only 100 units or so had been approved by the Australian side. Dung also said many small and medium-scale cattle breeders were facing severe competition from large rivals, like the Hoang Anh Gia Lai Agriculture International JSC (HNG), which has poured trillions of dong into importing Australian cattle to Vietnam for fattening and selling. "Small businesses usually import several thousand heads of cattle each time and will purchase more only after they have already sold them out. Meanwhile, HNG buys 30,000 to 40,000 heads of cattle each time," Dung said. The Da utu report said that at the end of 2016, the Viet Eco Farm JSC. launched a beef store chain called “Healthy beef” in Can Tho city, providing fresh, high quality Australian beef products in large quantities. In the short term, the company aims to supply beef for the Mekong Delta region, but plans to expand its market in other parts of the country, establishing new distribution channels. Viet Eco Farm also imports Australian calves to fatten and sells mature cows to abattoirs at thousands of heads per time. The company has invested a lot in breeding facilities and modern slaughter lines, and set up 450ha of pasture land to raise cattle. Chairman of the Vietnam Livestock Association Nguyen Dang Quang said the amount of imported Australian cattle was increasing rapidly, being sold at reasonable prices, enjoying preferential tariffs and becoming more popular with Vietnamese consumers. Australian beef is "dominating” the Vietnamese market, Quang said, adding that the more fierce rivalry between Vietnamese firms, the more benefits Australia exporters could enjoy.